Justice League vs. Bizarro League is available NOW on Blu-ray+DVD+Digital HD UltraViolet Combo Pack+Batzarro LEGO minifigure. Click below to get a set of five LEGO digital trading cards. You'll have access to Superman, Cyborg, Wonder Woman, Batman, and Green Lantern LEGO minifig cards. What better way to celebrate this release than by giving yourself a Bizarro name! Type your name into the LEGO Bizarro Name Generator App below, and it will reveal your Bizarro alter-ego. If you don't like your name, press the refresh button to try again! You can share your name from the app on Twitter and Facebook, and you can watch the official trailer and click the box art to bring the Bizarro League home today! One lucky Bonggamom Finds reader will receive a Blu-ray+DVD+Digital HD UltraViolet Combo Pack of LEGO: DC Comics Super Heroes: Justice League vs. Bizarro League, which includes a cool Batzarro LEGO minifigure! Enter via Rafflecopter below. Giveaway ends 11:59 PST on February 28, 2015. I will draw a winner after that date and post their name once the winner has been confirmed and verified. 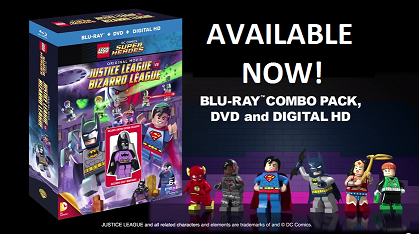 Each household is only eligible to win LEGO: DC Comics Super Heroes: Justice League vs. Bizarro League (Blu-ray+DVD+Digital HD UltraViolet Combo Pack) Blu-ray via blog reviews and giveaways. Only one entrant per mailing address per giveaway. If you have won the same prize on another blog, you will not be eligible to win it again. Winner is subject to eligibility verification. Continental US residents only. For more giveaway rules, click here. Good luck! Disclosure: Giveaway prize provided by Warner Home Video via PartnersHub. The views and opinions expressed here are my own. 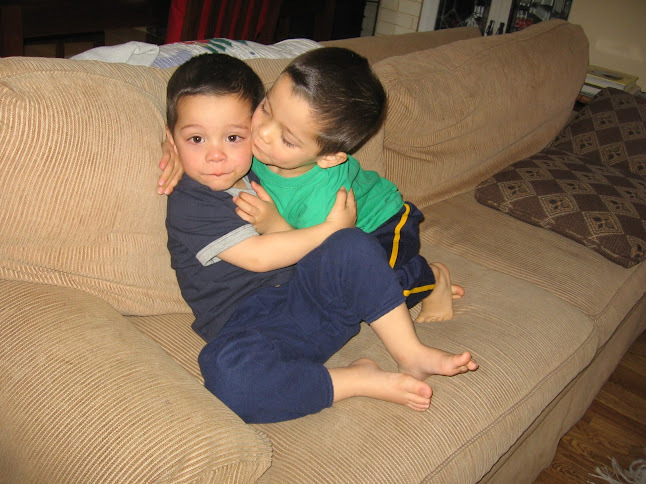 1) Snug someone you love! You can spread the love around even more by sharing a photo of your snug on social media with the hashtag #ShareASnug. 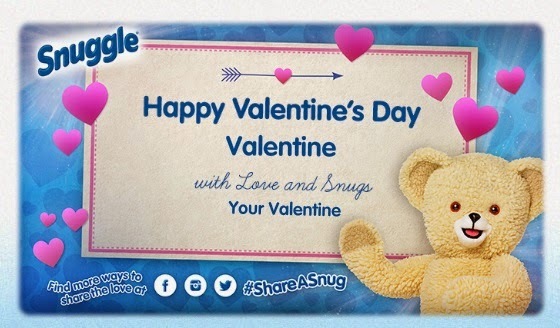 2) Send a Snuggle Valentine Video card, available on share.snuggle.com. You can choose from more than 400 names spoken by Snuggle Bear and five different video messages for friends and loved ones shareable on Facebook, Twitter, e-mail and accessible via desktop and mobile platforms. 3) Get on board the Snuggle Bus! Snuggle Bear will hit the streets of Manhattan on a SnugMobile to attempt a GUINNESS WORLD RECORDS record title of the 'most hugs given by a puppet in eight hours' on Feb. 13, 2015. Snuggle Bear will make stops all over the city, including Times Square and Columbus Circle, to invite people on board the snuggly soft bus, to share a Snug, take a Snuggle selfie, and receive a free plush Snuggle Bear to take home. Follow along on Facebook, Twitter and Instagram to join in the Snugs. 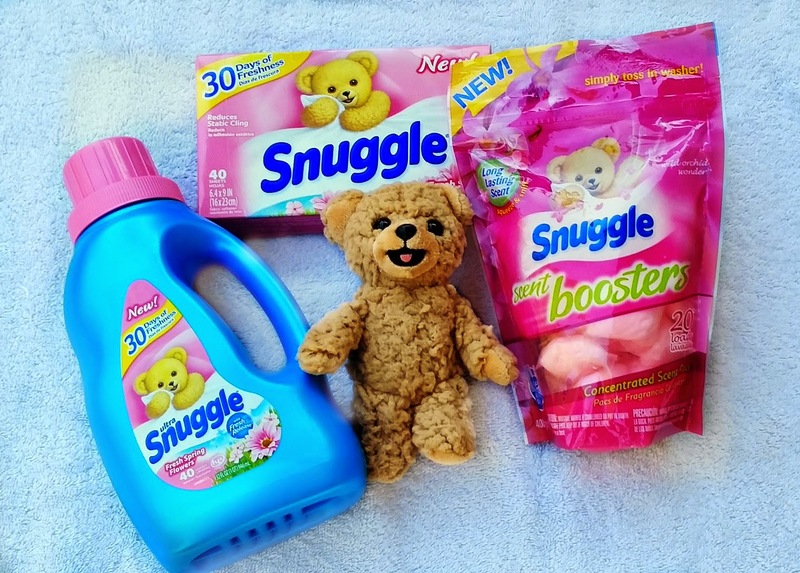 On Valentine's Day morning I plan to snuggle up with my whole family in bed -- and it's going to smell extra sweet, thanks to the Snuggle samples I received! 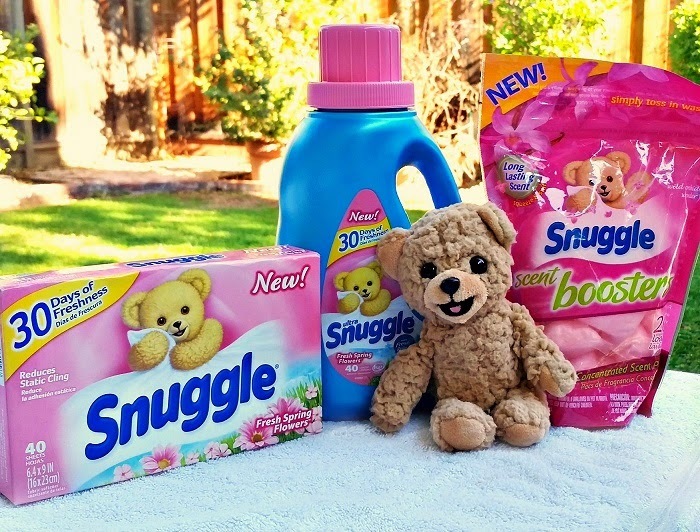 I've washed all our sheets with new Snuggle Scent Boosters and they smell divine :) How will you spend February 14 with your loved ones? Don't forget to give them a snug! Still looking for a Valentine's Day present for your loved one? How about something that will make him or her dance with joy: a Ultimate Ears (UE) portable speaker from Logitech! UE speakers are truly the ultimate -- in sound, in portability, in quality. With a UE MEGABOOM, UE BOOM, or UE MINI BOOM, you can take the party everywhere you go. Logitech sent me a UE BOOM unit to review, and I didn't need any more than a day to decide that it's a keeper. The gorgeous design, fun colors, (I chose red and black, but it comes in a variety of fashionable colors), and great sound make it the perfect present for anyone who loves to listen and dance to music with friends. 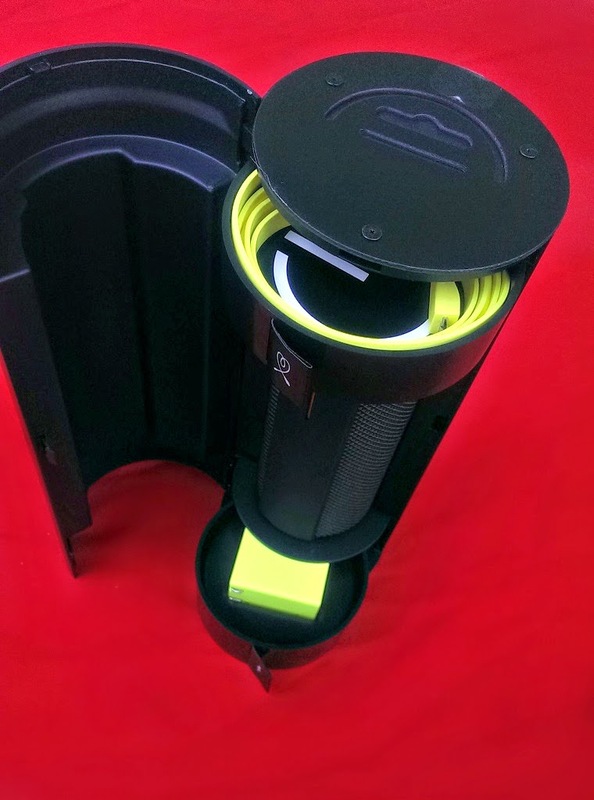 The UE BOOM comes with a cool, hi-tech-looking cylindrical case, which houses everything you need -- the speaker, a connecting USB cable, and a charging plug. The cable and plug slot nicely at the top and bottom, which makes it super easy to pack for travel. The UE BOOM is just over 7 inches long, and about 2 and a half inches in diameter. You can easily hold it in the palm of your hand. That portability came in really handy today, when I brought the UE BOOM to school with me today. I was able to carry it around, connect it to my phone via Bluetooth, and play music for the kids at lunchtime. The music came out loud and clear during our lunchtime dance party, and the kids loved it! It was perfect to take out into the middle of the field, where the school's regular speaker system can't reach. One of the best things about UE speakers is that you can pair them up! That's right, you use UE's Double Up feature to pair one UE speaker with a second, and control both of them right from your phone or tablet. You can combine the two speakers to amplify volume, or you can use the pair as stereo speakers to get left and right stereo sound. 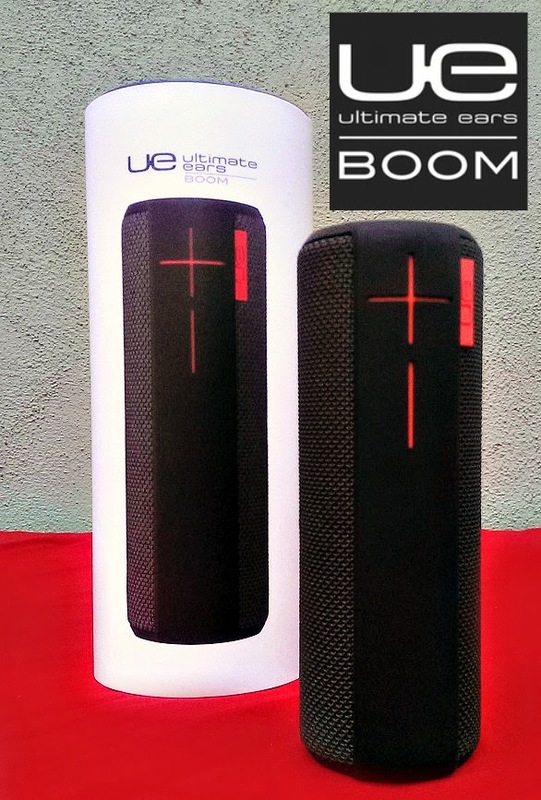 You can Double UP your UE BOOM with another UE BOOM, with a UE MEGABOOM (if you are running version 7x or 8x of the UE software), or with a UE MINIBOOM (if you are running version 5x or 6x of the UE software). 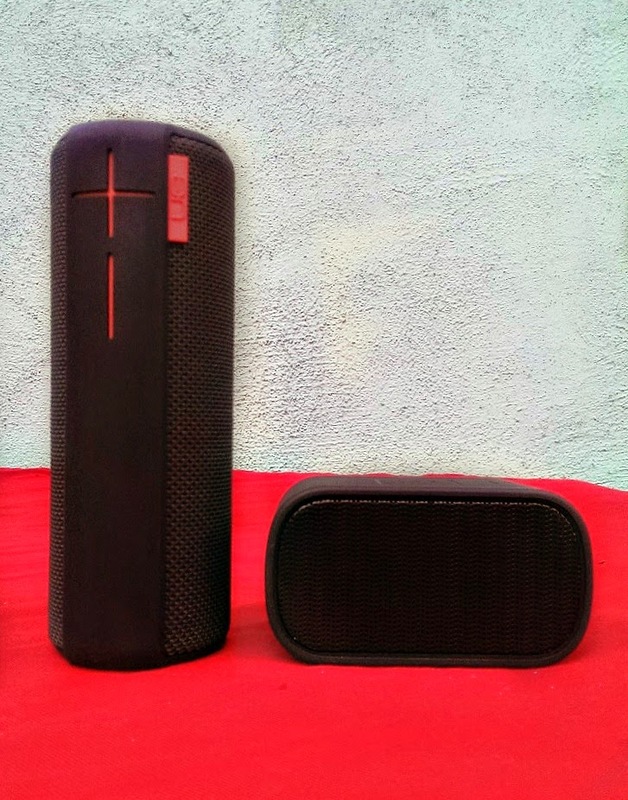 I actually own 2 UE MINIBOOM speakers, which Double Up nicely with each other, but I wanted to try Doubling Up one of the UE MINIBOOM speakers with my new UE BOOM speaker. 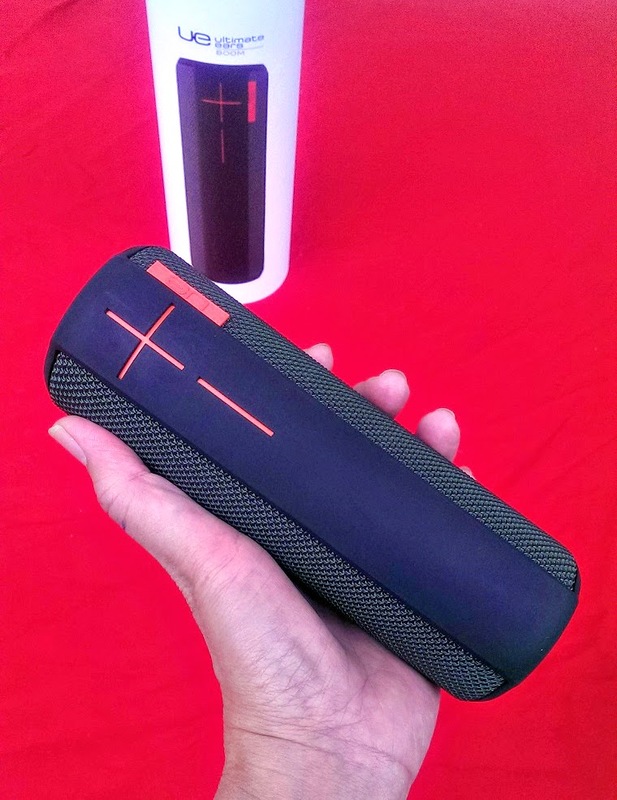 It was easy as pie -- just open the UE BOOM app, connect your UE BOOM, then select the Double UP option and add your second speaker (in my case, the UE MINIBOOM). I haven't found any other wireless speaker that can connect two units at once via Bluetooth, and I think it's a fantastic feature. Its 360-degree wireless speaker blasts loud, insanely good sound in every direction. Whether you stand it up in either direction or lay it down, it gives off amazing sound. It has a 50-ft Bluetooth® wireless range so you're not shackled to your speaker. Ultra-fast micro USB charging means you don't have to wait long to get the party started. Its 15-hour rechargeable battery means you can throw a marathon party. UE BOOM is just one of three options that Logitech offers for great wireless portable sound. If you want even more sound, you can go one step up with the UE MEGABOOM. If you prefer even more portability, check out the tiny but powerful UE MINIBOOM (read my review of the UE MINIBOOM!). 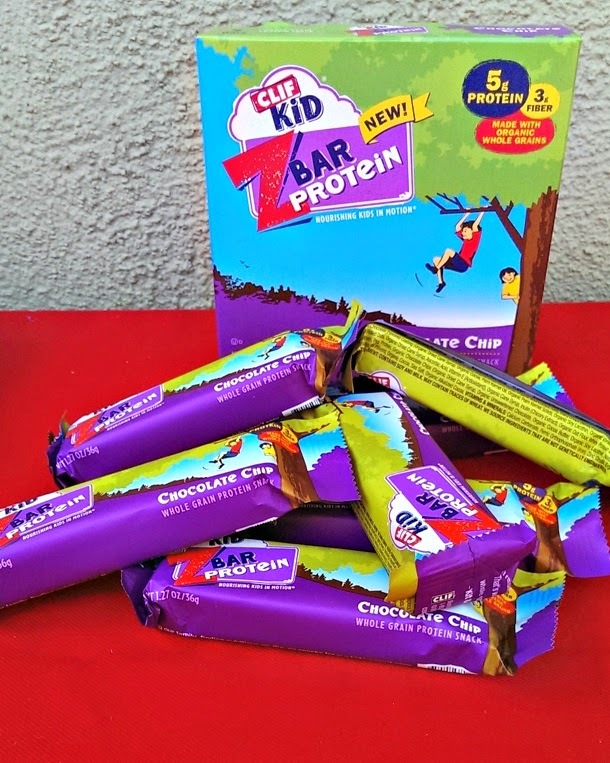 CLIF Kid ZBar Protein bars are the perfect healthy treats for growing kids, because each one contains a whopping 5 grams of protein and 3 grams of fiber. CLIF Kid only uses organic ingredients so you can feel good about serving your kids healthy, wholesome food. We received a box of the Peanut Butter Chocolate flavor (photo above) and 2 boxes of the Chocolate Chip flavor. My kids love the flavors (my favorite is the Peanut Butter Chocolate) and think they're as good as any bakery treat. 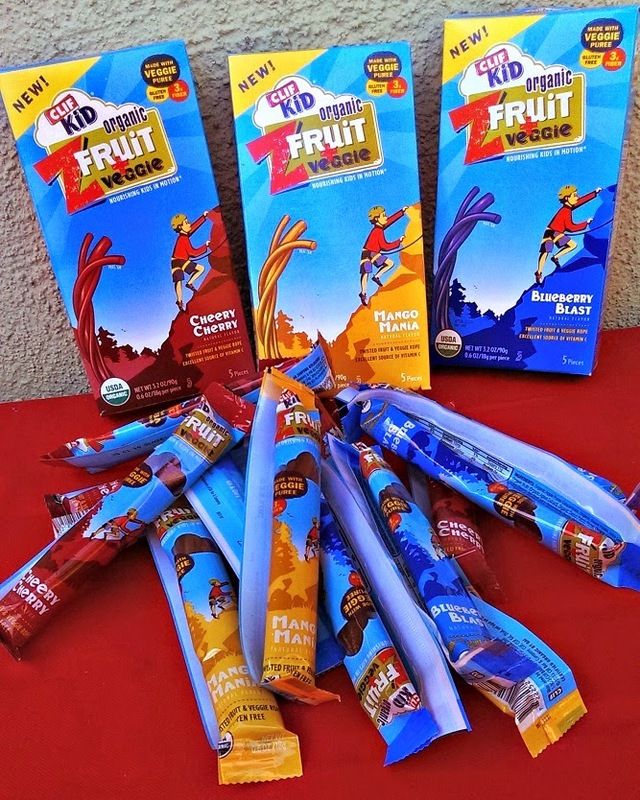 Instead of fruit gummies or fruit chews, why not serve CLIF Kid ZFruit & Veggie ropes? They're tangy and chewy and kids love them. Unlike most fruit snacks, these also contain real veggies -- sweet potato juice, sweet potato puree, carrot puree, red beet juice concentrate -- for an ever bigger health punch. We received 3 flavors -- Cheery Cherry, Mango Mania, and Blueberry Blast -- all of which taste great! 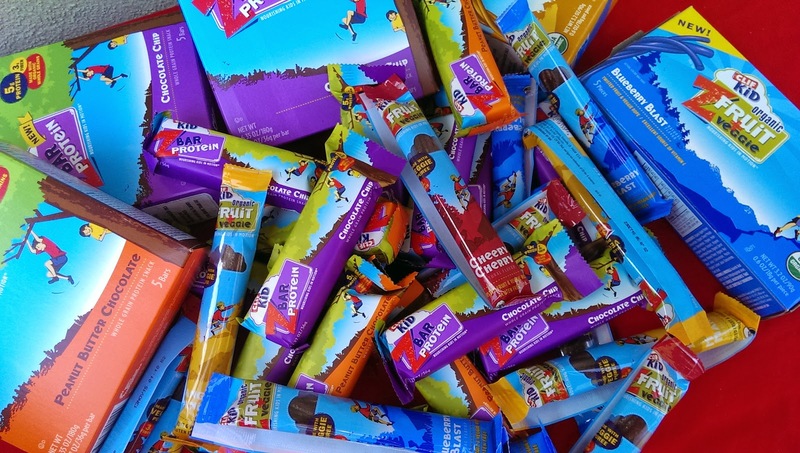 Like all CLIF Kid snacks, these do not contain any artificial flavors or high fructose corn syrup, and each bar or rope is made with organic ingredients. You can definitely feel good about serving CLIF Kid snacks at birthday parties, on playdates, in school lunchboxes, in Valentine's Day parties, or any day of the year. Our party was a huge success, and a big part of the credit goes to the CLIF Kid snacks I served! The party was held at a local paintball field. I placed a CLIF Kid ZBar Protein bar on each guest's plate so they would have something healthy to munch on besides cupcakes and rice krispy treats. 3Po and his guests spent over an hour running, dodging, darting, shooting, playing, and being extremely active. After their paintball session was over, they were sweaty and tired and very, very hungry. Needless to say, the kids devoured the CLIF Kid snacks in no time. 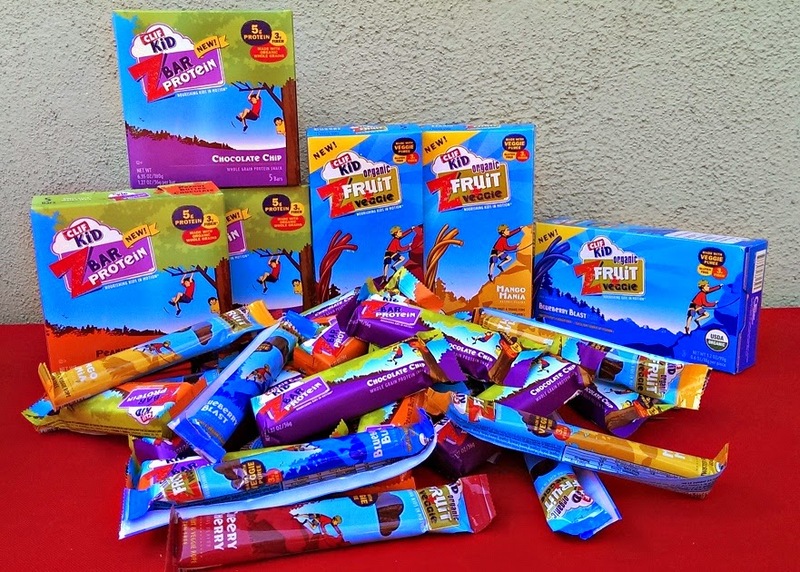 Each guest received a CLIF Kid ZBar Protein bar and a CLIF Kid ZFruit & Veggie rope in their goody bag, so they got to take some of that goodness home with them. Thank you, CLIF Kid, for helping to keep my kids and their guests healthy and happy! 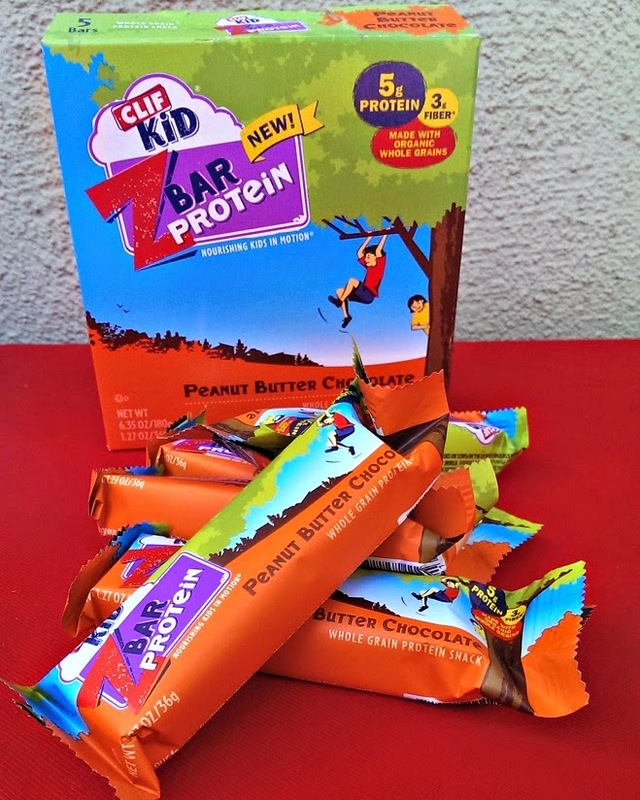 One lucky Bonggamom Finds reader will receive a 15-count box of CLIF Kid ZBar Protein in Chocolate Chip flavor and Peanut Butter Chocolate flavor! Enter via Rafflecopter below. Giveaway ends 11:59 PST on February 20, 2015. I will draw a winner after that date and post their name once the winner has been confirmed and verified. Continental US residents only. For more giveaway rules, click here. Good luck! Disclosure: I received samples from CLIF Kid for review. Giveaway prize is provided by CLIF Kid. The views and opinions expressed here are my own. 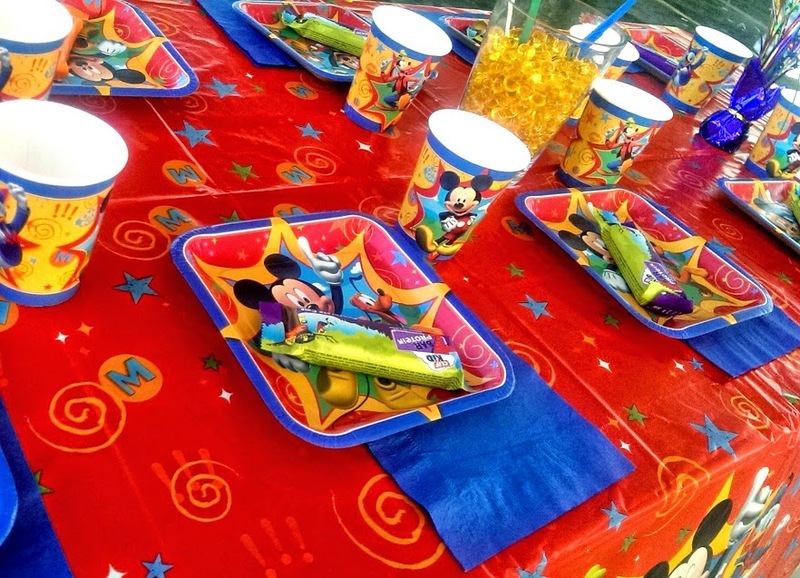 One of the easiest ways to save money when throwing a party is to make some or all of your own decorations. You can make wall posters, banners, bunting, signs, and so much more, with just some paper, pens, and paint. If you don't consider yourself the artistic type, then substitute pens and paint for a good printer! The internet is teeming with great ideas and images to print out. One of the most useful things that I received in my DisneySide At Home Celebration box was a set photo paper cards from HP. I used them to print out invitations and thank you cards for the party. 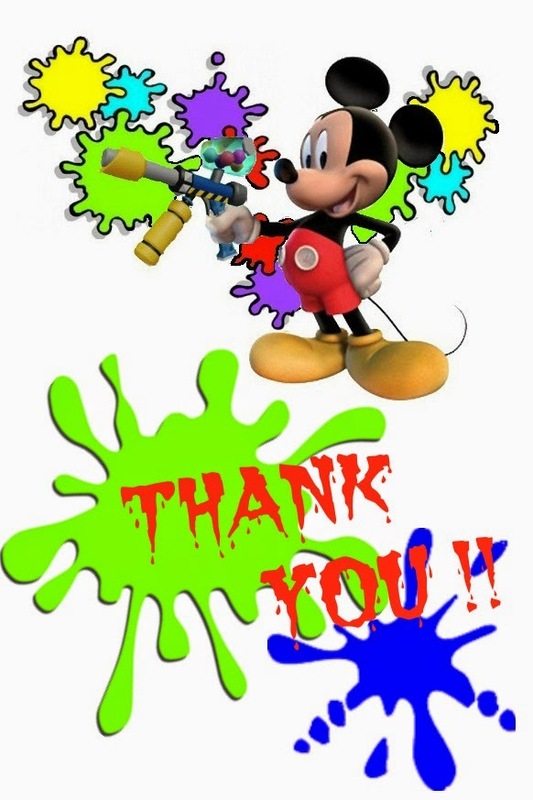 The theme of my DisneySide party was Paintball Mickey (because my son celebrated his 11th birthday with a paintball party), so I found an image of Mickey, an image of a paintball gun (from Disney Infinity), and some images of paint blobs. I combined them with a photo of the kids in their paintball gear for a cute and memorable thank you card. 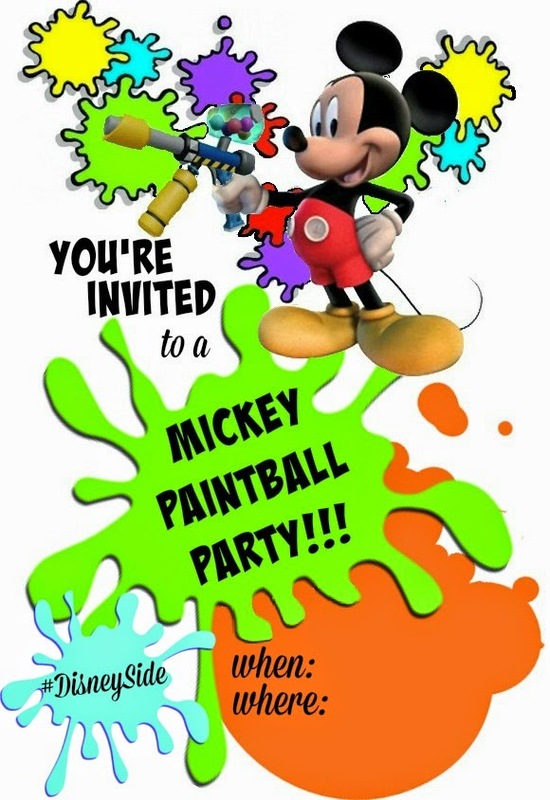 I also have a more generic Mickey Paintball invitation and thank you card image at the bottom of this post -- feel free to download and use for your own Mickey Paintball party! We held the party at our local paintball field. The place had a picnic area with first-come-first-served picnic tables, so I decided to make a birthday sign to mark our spot. Artist Simon Phipps generously allowed me to use his adorable Mickey Paintball artwork for the sign. I added a few more paint splotches and a Happy Birthday sign, then printed out two copies. I pasted both printouts onto a sheet of stiff cardboard, then attached it to a wooden stick. I stuck the sign into a glass jar filled with plastic beads in order to make it stand up. I also added a few smaller Mickey Mouse Clubhouse signs to make the display more festive. Everyone thought it looked cool, and all our guests had no problem finding our party table! Thank you so much Simon for letting me use your artwork! 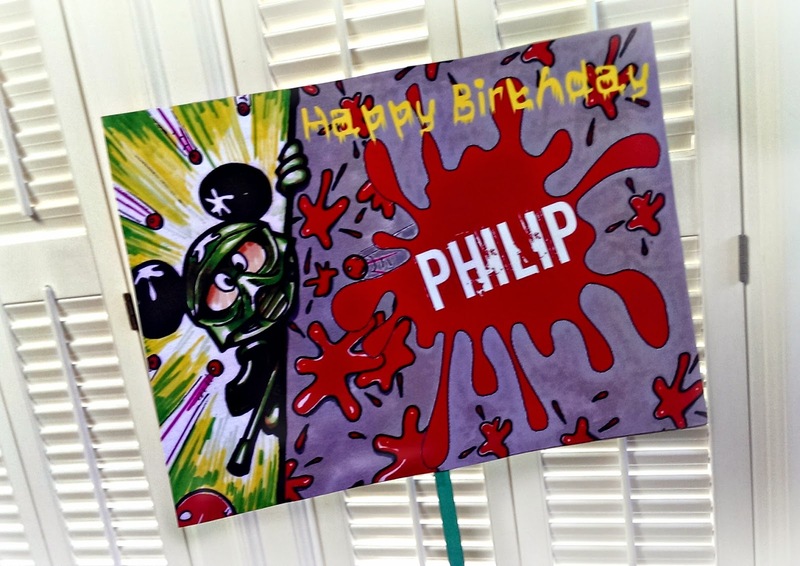 (Please note, the Mickey Paintball artwork belongs to Simon Phipps and cannot be used without his permission!). Below are the Mickey Paintball invitations and thank you cards that I designed. They should be printed on 4x6 photo paper. Feel free to download and print (if you do blog about them, please mention me and link to this post!). To see what other great things you can do with photo paper, go to MyPrintly, HP's new site for printing projects and ideas. Enjoy! Disclosure:I received photo paper samples from HP, courtesy of Disney and MomSelect. The views and opinions expressed here are my own. Some people hate snakes. Others hate spiders. Others hate creepy crawlies. None of that bothers me. What keeps me awake at night is..... bed bugs. They really bug me!! I love to travel and there's nothing I enjoy more than sleeping in a new city every night. The problem is that new cities mean strange hotels, and strange hotels mean beds... and bed bugs! It doesn't even matter how fancy the hotel is: any hotel, from five-star resorts to budget motels, can have a bed bug infestation. I always check for bedbugs when I get into a hotel room, and whenever possible I use my own pillow with its own dust mite/lice/bedbug protective cover. Yes, I'm probably overly paranoid, but have you seen the photos of people with bed bug bites on the internet? It's not a pretty sight. As far as I'm concerned, it's open war on bed bugs -- and I'm glad there are companies like Orkin who can provide the ammunition! Orkin, uses the latest technology and unparalleled training to develop an effective treatment. To learn more about Orkin's pest control based in science or to schedule an inspection, visit orkin.com or call 1-800-800-ORKIN. You can also follow Orkin on Facebook, Twitter, and YouTube. Are you feuding with bedbugs? Play the Bed Bug Feud and beat the clock to make the leaderboard! 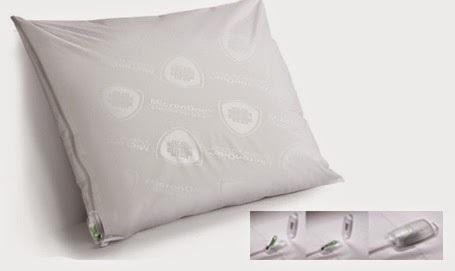 Want to win a CleanRest pillow encasement to protect your pillow from bed bugs, dust mites, and other icky organisms? Play the game, report your score in the comments below, and enter my giveaway. Good luck! Enter via Rafflecopter below. Giveaway ends 11:59 PST on February 18, 2015. I will draw a winner after that date and post their name once the winner has been confirmed and verified. If the winner has won the same prize on another blog, he or she will not be eligible to win again. Continental US residents only. For more giveaway rules, click here. Good luck! Disclosure: Giveaway prize and product samples for review provided by Orkin . The views and opinions expressed here are my own. Calling all Disney fans!! I've found even more ways to show your Disney Side! 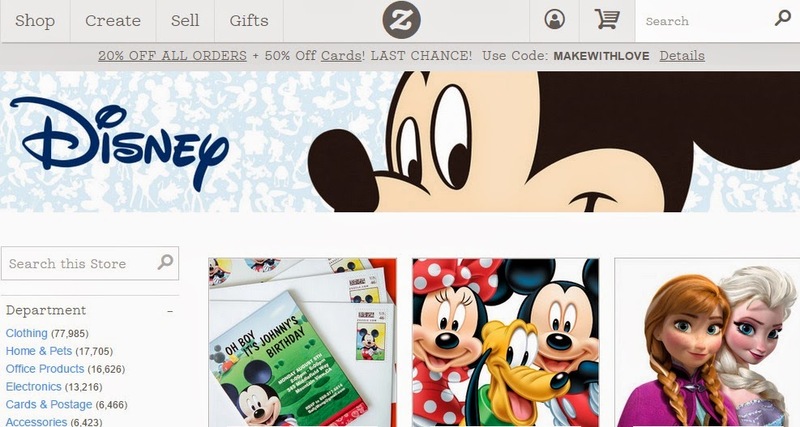 Did you know that Zazzle has a Disney store? They have literally hundreds of thousands of genuine licensed Disney items that you can personalize! 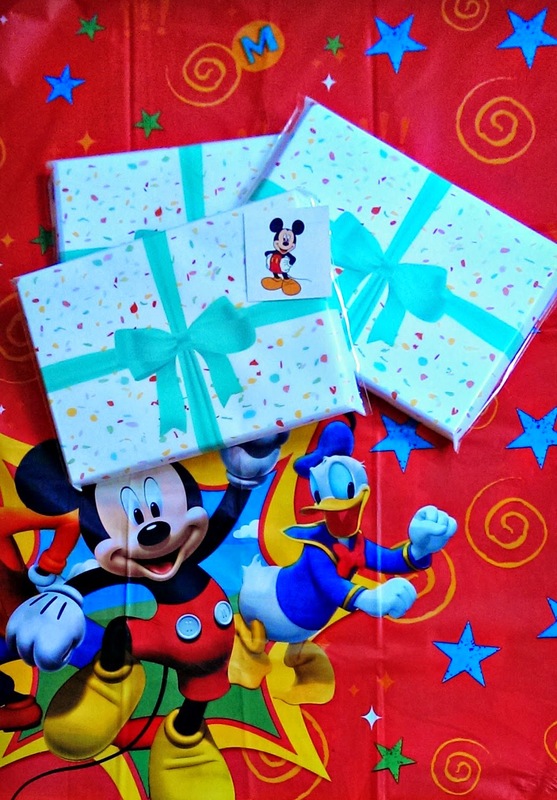 You can choose from hundreds of designs featuring your favorite Disney characters to add to shirts, hats, stickers, magnets, phone cases, mugs, bags, stamps, notebooks, and so much more. Like pretty much every Zazzle product, you can customize your Zazzle Disney item by adding your own photos and text. 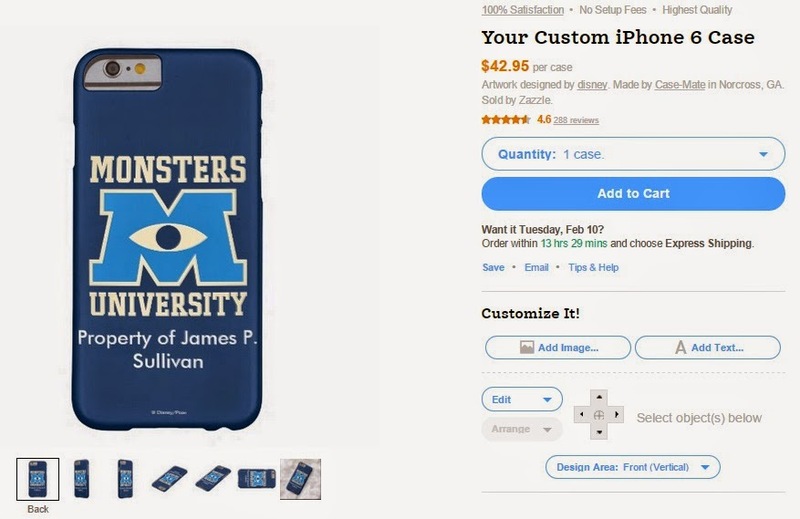 How cute is this Monsters University iPhone case, customized for James P. Sullivan, aka Sulley? I can totally see him, toting this around and texting during his classes! 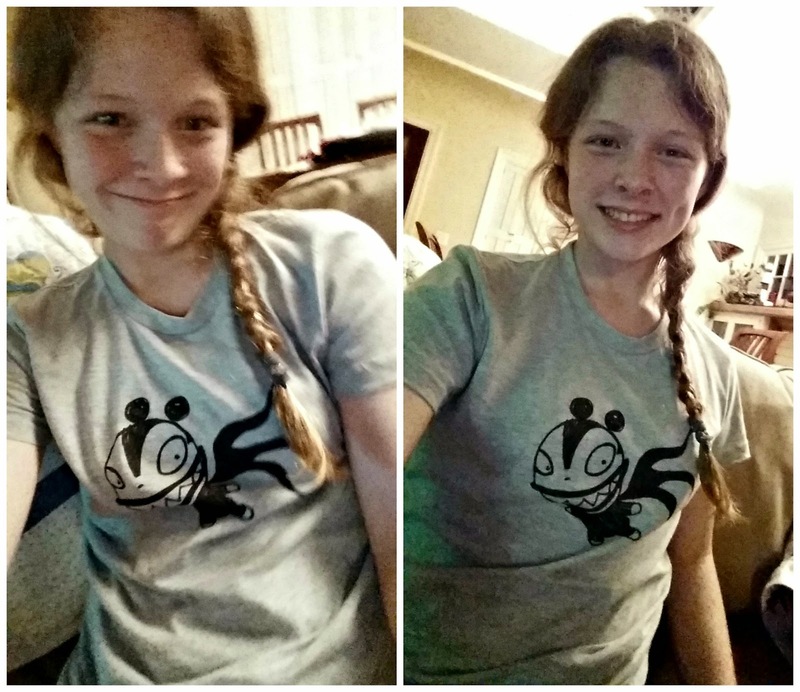 Zazzle invited us to try our hand at customization, and since The Pea and I will be traveling to Disneyland this spring for her middle school band trip, I took the opportunity to order some Disney shirts for both of us. The Pea is really into Jack Skellington and The Nightmare Before Christmas, so she decided on a shirt featuring one of the cutest characters from the movie, the Scary Teddy. 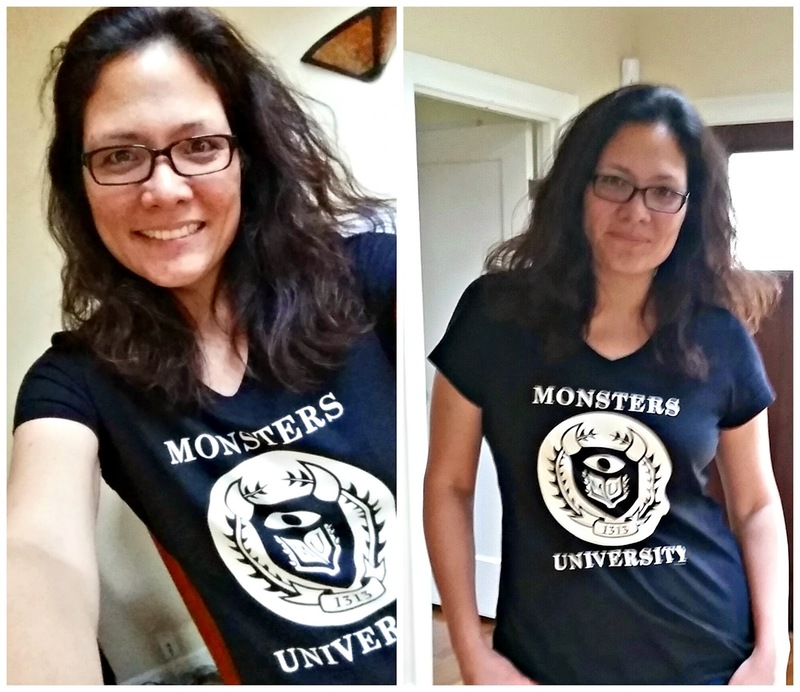 He's got such an evil, naughty grin that it's hard not to smile every time I see her wearing her Scary Teddy shirt. She chose to have it printed on a heather grey American Apparel tshirt, but she could just as easily have had it on a yellow tshirt, or on sweatshirt, long-sleeved top or tank top. This is not the first time I've ordered on Zazzle -- I was tshirt coordinator for my kids' elementary school for years, and I set up a Zazzle store so that families could order tshirts, bags, stickers, keychains, and mugs with our school logo. Their prices are great, and the products look great, and it's just as easy to manage the store as it is to order from it. 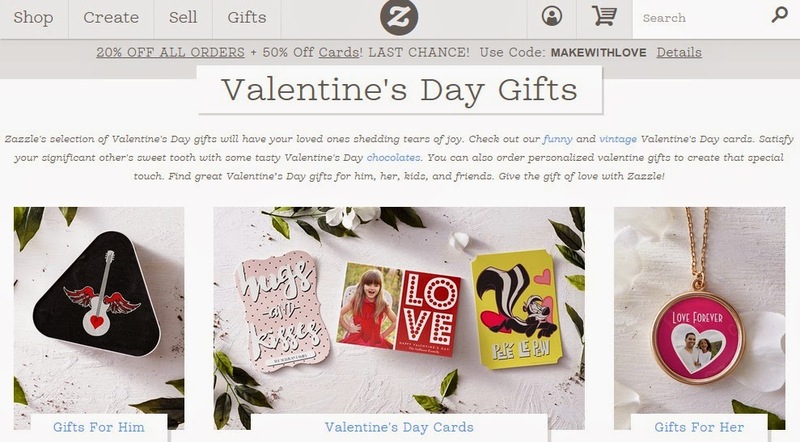 Don't forget, Valentine's Day is coming up, and Zazzle has as many gifts as there are ways to show your love. From cards to jewelry to throw pillows to flasks, Zazzle has it all. You can even personalize a box of chocolates! Disclosure: I received a gift card from Zazzle to facilitate my review. The views and opinions expressed here are my own. When I think of paintball, I think of paint splatters in lots and lots of colors. So for 3Po's paintball birthday party, I decided to make cupcakes decorated to look like paintball splatters. The easiest way to make a rainbow cake is to use Duff Goldman's Tie-Dye cake mix. I used the box that I received in my DisneySide At Home Celebration box, and I was really happy with how it turned out. It tastes great (waaay better than your run-of-the-mill cake mix) and you can't beat the beautiful colors. In addition to the mix, you'll need 24 gumballs and a batch of white buttercream icing, with about 1/4 of the batch dyed to match the gumball colors. Duff's Tie-Dye Cake Mix contains dry mix for a 2-layer 8-inch round white sponge cake and a packet of red, blue, and yellow food coloring. The instructions call for 3 egg whites, which was a surprise. All the ones I've used call for 3 whole eggs, but I think the cake turned out much lighter and fluffier because of it. 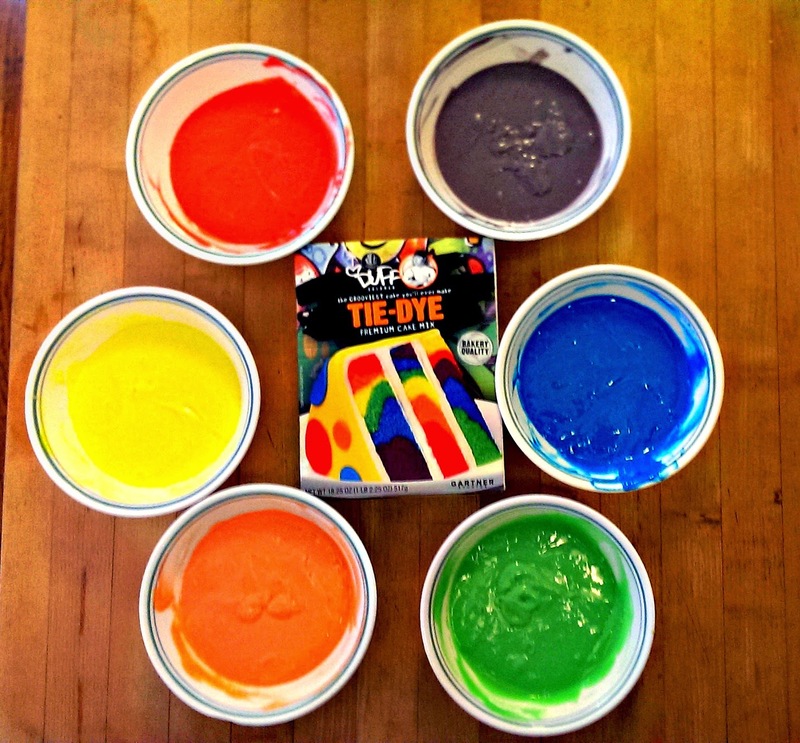 The idea is simple: divide the prepared cake mix into 6 equal parts, and dye each one a different color. The instructions specify exactly how many drops of red, yellow, and blue food coloring go into each color (red, yellow, orange, green, blue, and purple). You could definitely make a tie-dye cake without Duff's mix -- but you will not get Duff's amazing colors. Trust me. I tried. I could not replicate Duff's colors with my Wilton food coloring gels. You'll be making 24 cupcakes, so line 2 12-cupcake tins. I used red polka dot cupcake liners (because Mickey! ), and I was very pleased to see that they did not get washed out after baking. 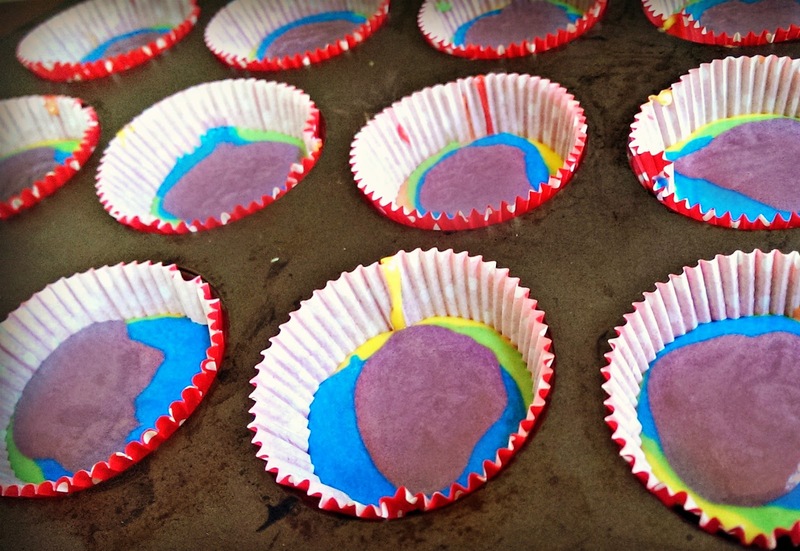 To get the tie-dye effect, take turns filling the tins with each color, dropping the batter right into the middle of the cupcake bottom, right on top of the previous color. 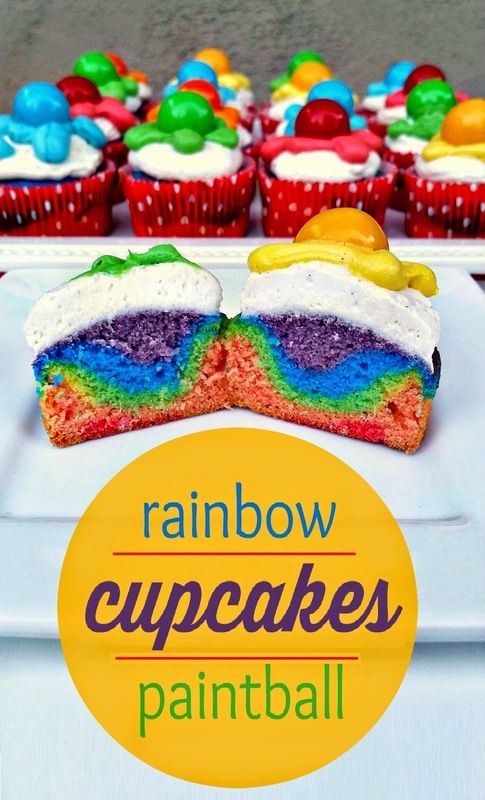 My fill order was red-orange-yellow-green-blue-violet, and for each color, I used about 1 tablespoon of batter for each cupcake. Filling the tins took a LOT of time! After baking and cooling, it's time to decorate! 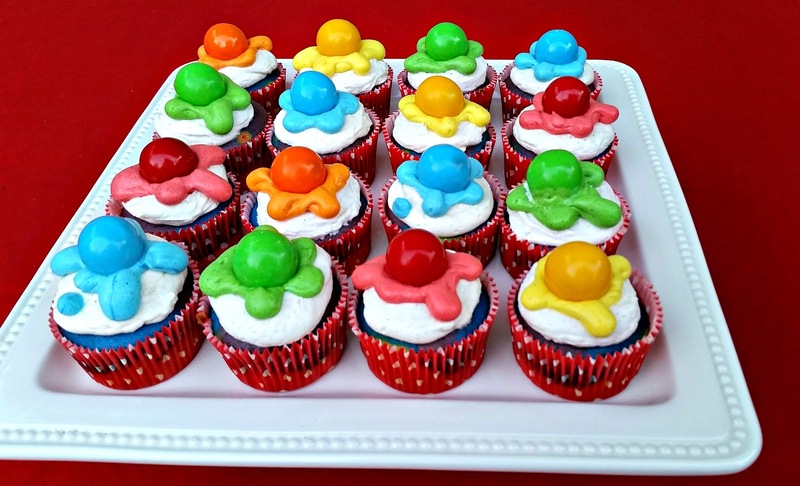 Frost each cupcake with white buttercream icing, then pipe a paint splatter using colored buttercream icing. Finally, nestle a gumball in the center of the paint splatter. Don't they look gorgeous?! 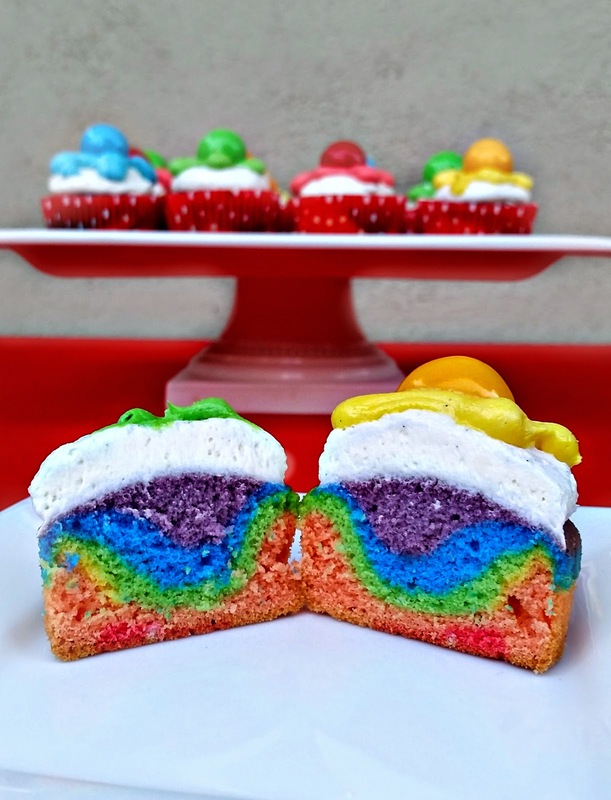 Everyone is in for a surprise when they bite into the cupcake -- a brightly colored rainbow! The colors did not get muted or muddied even when baked; they kept their bright colors. Even though the colors are extremely vibrant, they don't affect the taste of the cake. The cake itself is spongy and light and just slightly sweet, so it goes perfectly with the buttercream icing. 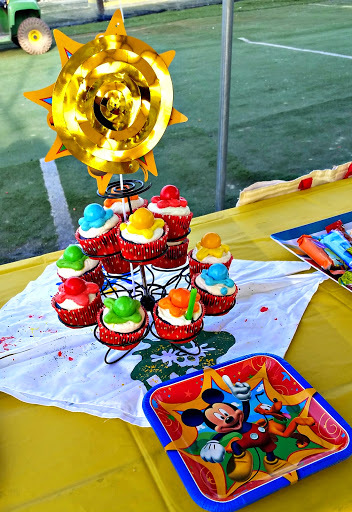 These cupcakes were the highlight of 3Po's Mickey Paintball Party! I couldn't think of a better way to celebrate his 11th birthday. Disclosure: I received a box of Duff Goldman cake mix as part of my DisneySide At Home Celebration Package, which was provided by Disney via MomSelect. The views and opinions expressed here are my own.